A cable tester evaluates whether a cable or wire is set up properly and connected correctly, ensuring that communication and electrical equipment is running smoothly. Use pipe locators, cable locators, and rebar locators to uncover underground energized and de-energized wires, cables, and pipes. 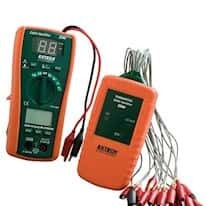 From troubleshooting electrical/electronic circuits to measuring cable lengths, our selection of multinetwork and telecom cable testers, wire length meters, fault locators, line identifiers, wire tracers, and time domain reflectometers (TDR) are designed for linemen and frontline technicians in both the communication and power industries.